Repression against practicing Muslims has significantly intensified in the North Caucasus this year. Disappearances or kidnappings of devout young Muslims have become more frequent in such Caucasian regions as Dagestan, Ingushetia, and Kabardino-Balkaria. During an official conference in Makhachkala, the capital of Dagestan, on June 6, the director of Russia’s Federal Security Service (FSB) Nikolai Patrushev, expressed concern that radical Islam in the North Caucasus is pushing away more traditional forms of Islam. In his talk at the conference, Patrushev also pointed to the fact that a growing number of Caucasian Muslims are receiving religious education abroad. “During the last ten years, thousands of young men have gotten training in religious institutes abroad,” Patrushev said. “Some of these students have become active agitators of ideas that are alien to Russian traditional religious values” (Interfax, June 6). Patrushev’s speech was a signal to security officials in the North Caucasus to intensify their activities in searching and detaining devout practicing Muslims in the Caucasus. Imams of regional mosques play a key role in this activity. They provide the police and the FSB with the names of those who visit a mosque too often or whose way of praying differs from the others. There is a difference in praying between Sufi Muslims (Sufism is the dominant school of Islam in some regions of the North Caucasus; the Russian authorities regard Sufism as a less dangerous branch of Islam than the other branches, especially Wahhabism or Islamic fundamentalism) and others. The noon prayer of a Sufi in the Caucasus lasts a little bit longer than the prayer of an ordinary Muslim. If a man regularly finishes his noon prayer a little bit earlier and then leaves the mosque, this could mean that he is not a Sufi, but an adherent of another branch of Islam, including Salafism or Wahhabism. It should be noted that the majority of the Muslims in the world do not have prayers that are as long as those of the Sufis of the North Caucasus, so if a man leaves the mosque earlier than the others do, this is not necessarily proof that he is an adherent of Salafism or Wahhabism. All of the imams of the mosques in such Sufi dominated Caucasian regions as Dagestan, Ingushetia and Chechnya have special instructions from the police and the FSB to report on all those who leave the mosque before the end of the noon prayer. Arresting or kidnapping a man who is on an imam’s blacklist is a common thing in the Caucasus. At the end of the last year, a young man who had had arguments with an imam of a local mosque in Makhachkala over how to pray was detained by the police and found dead the day after his arrest. According to Lev Ponomarev, head of the For Human Rights movement, 18 men were kidnapped in Dagestan during April and May this year, all of them devout practicing young Muslims. A Muslim who simply goes to mosque too often can also be regarded as a suspicious person. During the last two years, the police carried out several raids on mosques in Makhachkala in the early morning, during morning prayer. Security officials believe that only a true Muslim can attend a mosque so early, and they regard all true Muslims as potential rebels. The hunt for practicing Muslims is currently under way in Ingushetia. As the Ingushetiya.ru website reported, during a recent meeting of police officers, Musa Medov, the republic’s interior minister, declared that the lists of the names of those who leave mosques at noon earlier than others had been coordinated with the Spiritual Directorate of Muslims of Ingushetia (the official Muslim organization). Medov added that persons on the lists were Wahhabis and should be eliminated. The Galaev brothers from the Ingush village of Sagopshi are the first victims of this new campaign in Ingushetia to eliminate those who pray “in a wrong way.” On September 27, Said Galaev and Ruslan Galaev were killed by a squad of special forces who had raided their house. The policemen said that the brothers tried to resist and shoot at them, but Bamatgiri Mankiev, head of the Human Rights Commission of the Ingush parliament, told the newspaper Kommersant that the Russian policemen shot them while they were still in bed. Mankiev insists that the only thing the Galaevs were guilty of was being on the blacklist (Kommersant, September 28). Sometimes the hunt for the “wrong Muslims” becomes so absurd that young men who simply have a healthy lifestyle also become victims. As the Chechen journalist Ruslan Sultanbekov told Jamestown, his friend in Chechnya had been arrested and called a Wahhabi simply because he did not smoke or drink alcohol. In the western part of the North Caucasus – Kabardino-Balkaria, Karachaevo-Cherkessia, and Adygeya – where there are practically no Sufis and Islam does not have such deep roots as in the East, Muslims who do nothing more than pray in public and go to the mosque can be added to the blacklist. After a period of relative calm that lasted for about one year, repression against practicing Muslims has again intensified in the western part of the North Caucasus. According to the “For Human Rights” movement, this past summer, the anti-organized crime unit of the police in Karachaevo-Cherkessia detained dozens of practicing Muslims. Human rights activists say that all of the criminal cases that were initiated against the detained Muslims were fabricated with only one aim: to send as many local Muslims as possible to prison for a long time and thus secure the region before the Winter Olympic Games in Sochi in 2014 (Karachaevo-Cherkessia is adjacent to Sochi). As for Kabardino-Balkaria, the reprisals in the region are even worse, because practicing Muslims are not only arrested, but are often kidnapped and disappear without a trace. On September 26, the separatist Daymokh website reported the disappearance in Kabardino-Balkaria of two young businessmen known in the republic as devout Muslims. The aim of such reprisals is clear: in detaining practicing Muslims, the security officials are trying to neutralize potential rebels and sympathizers of the insurgency. It is likely, however, that even the FSB leadership is not absolutely certain that these reprisals will work. 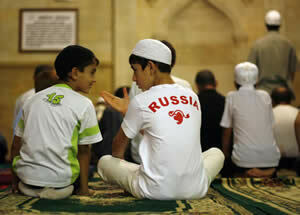 The lack of other effective methods is forcing the FSB to resort to the dubious practice of targeting young Muslims.